belt drive with planetary gearbox. with high performance electric motors. 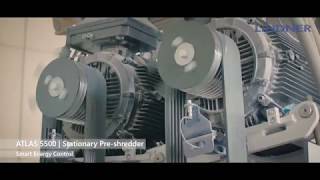 with innovative energy management during shredding. with an ingeniously simple combination of tried-and-tested components. thanks to lightning speed, software-controlled shaft reversing. ensured with individually controllable shafts. through synchronous and asynchronous shaft operation. thanks to optimized drive dynamics. thanks to the drive unit’s lightning-speed disengagement. thanks to effective shredding in both directions of rotation, even when one shaft stops. due to slow-speed ripping shafts and the system’s robust frame design. due to the special geometry of the shredding system. control all of the shredder’s functions via remote. via simple connection with the central control system. thanks to an intuitive touch-screen located directly in the control cabinet. High-performance welding rod for extra long service life for heavy industrial use to protect shaft and frame. Our optional water sprinkling system to reduce air-borne dust at the filling area offers a central water pipe with four nozzles in the enclosed hopper with suction point which can be easily activated via the control panel or the remote control. The system is designed for year-round use (down to -25°C). The fire extinguishing system detects sparks and overheated objects, protecting the system when easily flammable materials are being processed. The sensors monitor not only the shredder but also the discharge conveyor and where necessary trigger the extinguishing process. Thanks to the central water supply, the pressure tank is subsequently filled automatically and once again ready for use. Thanks to being connected to the control system (Profibus® or Profinet®), status/maintenance messages can be generated directly and the machine operated from the control room. MERCILESSLY EFFICIENT: PROVEN CONCEPTS INGENIOUSLY APPLIED. The Lindner Atlas is the next big thing in primary shredding. Based on the proven belt concept, the electric drive with a high-performance planetary gearbox delivers the highest efficiency in its class thanks to innovative software controlled energy management. When combined with asynchronous control of the tools, this ensures constant discharge and maximum efficiency, even when one shaft stops. The Atlas also boasts Lindner’s trademark robustness and enormous throughput rates. The proven recipe for maximum efficiency. The guarantee for maximum output and highest flexibility. The cutting unit that knows now mercy. Simply efficient: The new Lindner software controlled drive management. The torque-limiting clutch prevents the drive unit from being damaged by blockages caused by foreign objects – long service life guaranteed. * The stated values refer to standard machine versions with a standard hopper (large) and raised feet. 20' 11" x 9' 8" x 16' 5"
16' 6" x 6' 7"